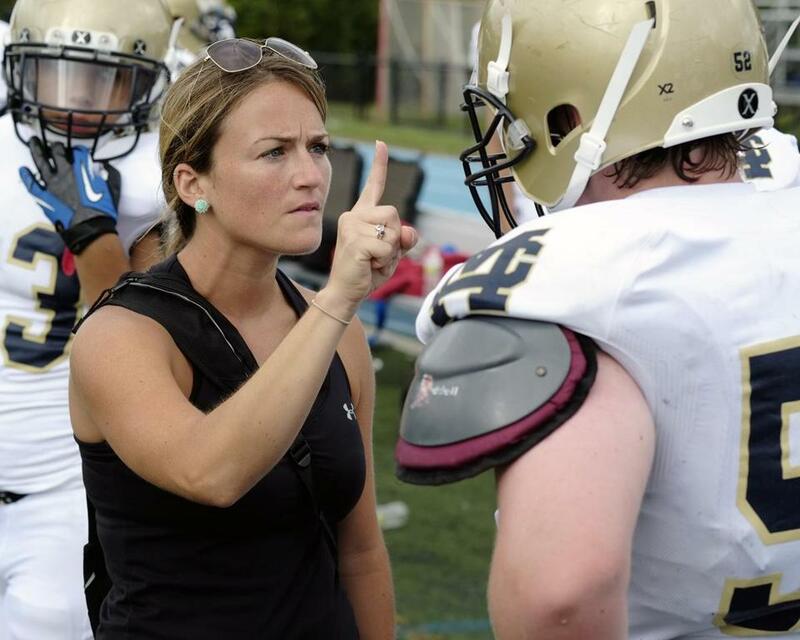 A Malden Catholic High School athletic trainer administered a concussion check to a player during a 2012 game. After a decade of intensive research on the health effects of concussions, medical guidelines and some state laws now insist that if a young athlete displays any symptoms of a concussion following an injury, he or she should leave the sports field immediately and not return to play. Yet a startling 38 percent of student athletes do return, according to research presented at the national conference of the American Academy of Pediatrics on Oct. 22 in San Francisco. The consequences of continuing to play after a head injury can be severe, the study found: Those athletes subsequently suffer from more severe symptoms than those who sat out. “Continuing to play puts an increased demand on the brain, and puts them at risk for a more severe injury and prolonged recovery,” says study coauthor Shane Miller, a pediatric sports medicine specialist at Texas Scottish Rite Hospital for Children in Plano, Texas. Miller first became concerned about same-day return after concussion when he started asking his young patients if they had kept playing after a head injury. Too many were saying yes, he recalls. To determine the scope of the problem, Miller partnered with Meagan Sabatino, Texas Scottish Rite’s research coordinator for sports medicine, to analyze records of 185 patients he had treated for concussions between 2014 and 2015: 133 males and 52 females between the ages of 7 and 18. Overall, 71 of the patients (38 percent) reported returning to play on the same day as their initial injury. About half the athletes sustained concussions while playing football; soccer was the second highest-reported sport. There were no differences in the rate of returning to play based on gender, age, sport, or immediate symptoms. When patients arrived at the clinic, the ones who returned to the field experienced more and worse concussion symptoms than those who had not, including nausea, dizziness, balance problems, and confusion. Since the initial study, Miller and Sabatino have expanded their research to include additional patients and plan to soon publish their results in a peer-reviewed paper. Miller has also begun seeking the cause of the problem: Why do these young athletes keep going back into the game? While the data aren’t yet in, most athletes anecdotally fall into one of two categories, he says. The player either has an “athlete mentality,” in which he knows he is injured but wants to continue playing; or he truly believes his injury is minor, and symptoms later worsened. “It’s really important for parents and coaches to be aware of the signs and symptoms of a potential concussion, so that when one does occur, they may be able to recognize it,” says Miller. After a blow or jolt to the head, symptoms of a concussion include one or more of the following: headache, nausea, dizziness, confusion, concentration or memory problems, and changes in behavior or sleep.